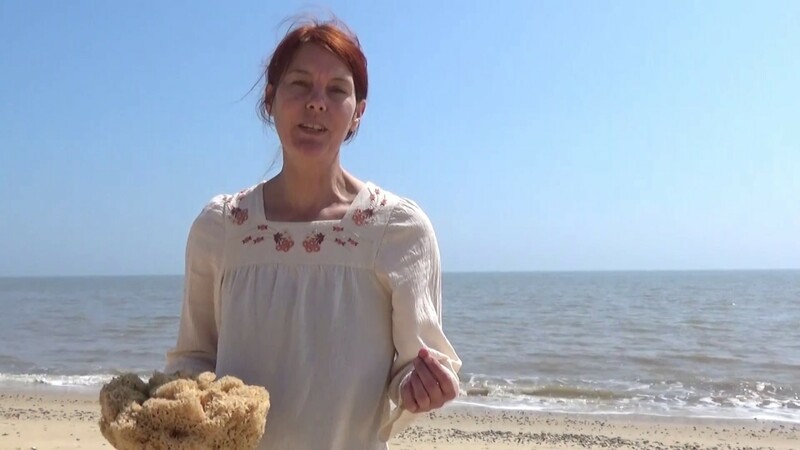 Choosing Sea Sponges for Face and Body Care. Hello I’m Sally from Natural Spa Supplies. Lately I’ve been asked two questions repeatedly. Which is the best sea sponge for face care and which is the best sea sponge for natural showering and bathing? This is a giant honeycomb perhaps we won’t be using this one for face care, but I can show you all the different types and you’ll soon have a very clear idea of which ones you need to choose. I’ve got a selection of sponges here. They all come from Greece They’re all harvest in the traditional way where divers dive for them cut the body of the sponge off. They leave the foot behind and then the foot reforms into a new sponge. So all these sponges are still out there growing. So I’ve got the main different types here. This is called an elephant ear sponge. Well you can guess why – kind of like an elephant ear. These are the honeycomb of course this is a more modest-sized honeycomb and you can actually understand why it’s called a honeycomb because of the structure there. This is called a sea wool and it’s because it actually feels like sheep fleace, a very very soft sponge. This one’s called a hard head. They are quite squashy but they’re called a hard head for some reason. This one’s called a macho fina. it’s quite a bit more dense and kind of a very regular structure throughout. This one is called on a silk fina. We’re going to focus on these two types of sponges: Honeycomb and the Silk Fina. So the honeycomb sponge. Here’s the honeycomb-like structure and our silk fina. Now let’s see what happens … when we get these two wet. So you can appreciate now how the surface is changed and how well a sponge could clean the body. It will actually dry quickly as well. This is the the silk fina sponge and again – Can you see the surface structure? like all these little tiny or fingers or hairs. When you clean the face with this they will actually reach inside the pores and they do an absolutely fantastic job. You’ll appreciate even from the first use just how well are they clean and actually how pleasant they are to use. A sponge will hold an incredible amount of liquid. So the sponge is just happily sitting on my hand. Wait for me to squeeze it. There’s a lot of liquid in there so it’s great if you’re applying of a liquid substance to the body example I use on seaweed as a hair conditioner. I can control and apply the seaweed perfectly with us with a sponge. They’re great if you are soap lover and you love all the foam and the bubbles then This is the best kind of bubble making sponge you could acquire. So remember four and a half inch sponge, three inch, four inch sponge fantastic just for kind of washing the face. A 2-inch sponge you might prefer around the eye area that or the nose and then the one-inch sponge is particularly good for washing the delicate eye area. Thank you very much for watching. You’ll find all of the information about sponges on our website and that’s www.naturalspasupplies.co.uk We’ve got photos of all the different types and descriptions and the sizes. If have any questions just give us a call and that’s 0800 023 5008. Thank you very much for watching. .